In a previous blog we explained that we have moved away from large IT contracts, handled by a single outsourcer, to a “tower model”. 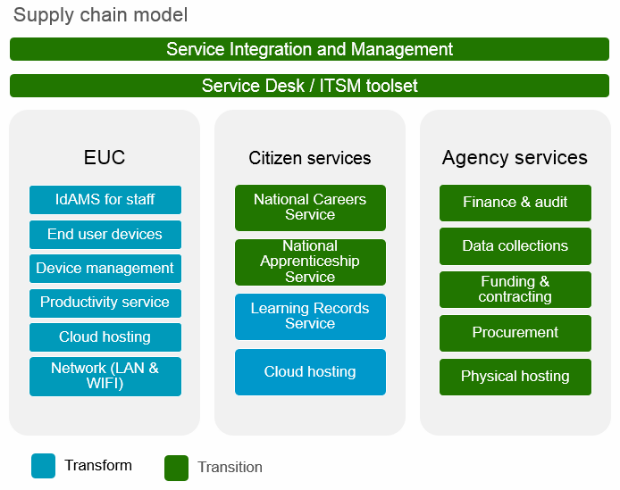 In this model separate IT components are supplied by different companies, and Service Integration and Management (SIAM) and a service desk run across the towers. Three months in how are we feeling? Transition is now complete, with all of our procurement lots delivered and the SIAM model up and running. We breathed a collective sigh of relief that we had ‘got through’ the transition phase with minimal disruption to business as usual. Our out-sourced SIAM is providing a front line service desk, operating our ITIL processes using our ITSM toolset, managing the supply chain against contractual obligations, conducting supplier service reviews, and bringing this all together to deliver an end-to-end service to meet our customer needs. The retained in-sourced SIAM team ensures that we receive the operational services the SFA needs, using service and contractual governance, along with ITIL process assurance and support. Reflecting a little more on business as usual, does an apprenticeship candidate care if we are changing our entire supply chain? No, our customers need and want a reliable service. Thanks to good planning and testing, we were able to transition our supply chain while seamlessly maintaining the service for our users. Have we finished? No, we are now in the transformation and refinement phase. What’s working? What’s not? Does everyone understand the new model? Do we have the correct balance of out-sourced SIAM and in-sourced SIAM? How is collaboration working across the supply chain? What provides the best value for money services? Has everybody in the support mix, internal and external to our organisation, heard about and understood the new SIAM model? How much support does the retained SIAM team provide to the out-sourced SIAM? Now we have greater granularity of supplier costs, I have an improved understanding of the total cost of ownership for each service, what are the financial levers I have to make cost savings? As I am not talking directly to the service tower can reporting be improved so I still understand all the nuances of my service? We didn’t expect the operation of the SIAM model to be perfect from day one - if we'd waited for utopia we would never have transitioned. The feedback we’re gathering from our survey is helping us design an improvement plan, and I'll share details in a future blog post.